As every year since 2014, May 2 is not only a national holiday and the middle of Poland's longest weekend (9 days long this year, a bit excessive perhaps), it's also the day when all eyes of the football community turn on Warsaw's PGE Narodowy, where the annual Polish Cup Final takes place. Dominated by three teams in recent years, the game saw Legia Warszawa face Arka Gdynia, cup winners in three past editions. On the field Legia's dominance wasn't questioned until stoppage time, in the stands it was more of a mixed bag. But it should be noted that once more it was a huge event, with 47,037 people in attendance. We mention that because two decades back the cup final had crowds of 4,000 and was played in obscure locations, so it's a massive change. Just like the teams playing in the final, their fans were also certain to add a lot of colour and heat to the game. Both end zones were awarded to supporters of Legia and Arka in almost equal proportions, roughly 10,000 behind each goal. While fans of the Warsaw team chose to walk together from their home stadium, those from Gdynia chose to travel their 360km on board of 6 leased trains. We knew from the start there would be quite a show and even special precautions wouldn't stop supporters from bringing in pyrotechnics. It should be noted that there were sniffer dogs employed, content of the tifos was scanned for pyrotechnics with equipment borrowed from the Chopin Airport and all cars from organised groups, journalist or even the Polish FA president were checked in the smallest detail. Still, just look below at how much was smuggled inside. 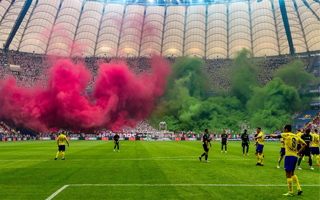 According to official information from PGE Narodowy, some 400 pyrotechnics were lit, while roughly 1,900 more 'pyro' items were seized before the game. Unfortunately during one of the last displays from Arka's supporters one flare was thrown onto the field. Even worse, a hooligan was launching rockets, trying to reach the opposite end of the stadium and harm Legia's supporters. While no injuries were reported, one of the rockets has hit the retractable roof's garage, hanging centrally above the field, causing a minor fire of webbing protecting the membrane. Two more are reported to have damaged the roof membrane, which may mean the harshest ever penalties for participant clubs, especially Arka. Sure enough, the game has already caused as many voices of praise as outrage in the first hours after its conclusion. PZPN, following the experience of previous years, used special safety measures and still failed miserably in stopping fans from bringing inside... basically anything they saw fit.